Sophomore films can be tricky stumbling block, and with an Oscar award-winning first film behind you, there’s a long way to fall. Get Out writer and director Jordan Peele doubles down, by presenting us with a piece that is both thematically challenging, and even more ambitious. To reveal too much would be a disservice to Us, as there is a certain joy in discovery. Suffice to say, that after being traumatised by a childhood incident, Adelaide (Lupita Nyong’o), begins to once again worry for the safety of her family as they revisit the sight of the event. It turns out to be a prophetic warning that bears fruit, when a family show up one night in the driveway of Adelaide’s childhood home. A family that is strange and violent, but look uncannily like Adelaide’s family. Whereas with Get Out you can easily point to “race” as the central theme being explored, Us is a bit more nebulous with its message. It is a film packed with meaning, but the duality that is central to its plot, also stretches through to the very soul of the film, clouding the way you view it. It is a film that you can look at through many different perspectives, through many analytical lenses, and come out with various different meanings. In the simplest terms it looks at the politics of envy, xenophobia, identity, insecurity, capitalism, division, and the treatment of the “other” – all through the filter of urban myth. Us is a Rorschach test that will change the more you view it, and I suspect based on the political climate from which you are viewing it from. That said, it’s a film that will reward, even require multiple viewings, and that is an achievement. It’s a work that intensifies as it progresses, often shifting slightly in tone and morphing as it goes on. 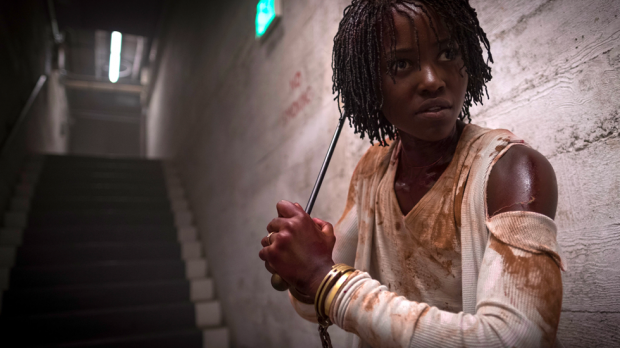 With his take on the doppelganger myth, plus some intense elements of the home invasion genre, Peele manages to maintain a sense of tension throughout, keeping the audience on edge. Yet he also knows the importance of humour as a relief mechanism, giving us a lot of dark laughs along the way as he plays with expectations of the genre. All of which gives Lupita Nyong’o (12 Years a Slave, Black Panther) a platform on which to shine. Playing the dual role of Adelaide and her “Tethered” (how Us refers to the doppelgangers) counterpart Red, Nyong’o is able to showcase her range, stretching from protective mother and frightened victim, to murderous creature. What is incredible, is she deliberately allows certain aspects to bleed into each performance, while each remains distinct, allowing us to see the links between the two. We can see the differences, but also that the similarities are more than just looks. She’s backed up here by her strong family, with Winston Duke (Black Panther) providing a lot of the comic relief, Shahadi Wright Joseph a fair bit of the action, and the young Evan Alex adding an element of emotional depth. Not the clean, crisp work of Peele’s debut, Us is rather a wondrously crazy vortex of metaphor and the horror genre to delve into. Yet through it’s beautiful composition, creative storytelling and sharp sense of social commentary, it’s a film that will certainly haunt your thoughts for a long while afterwards.